I finally made it to eleven o'clock last night before I turned my light out. I actually spent quite a bit of time IRONING if you can believe it but I'm listening to a good book and it was really quite pleasant, smoothing cloth with heat and the hiss of steam, listening to a well-written and well-narrated novel. The book I'm listening to is one by Miriam Toews, an author whom I do not believe I've ever read before and isn't it a joy when we find another author to love just when we think we've gone through all of them? I'm sure that my Canadian friends know her name and probably her work. She's quite recognized and lauded in her home country and she should be here, as well. The book I'm listening to is Irma Voth and I'm reading it after listening to another book of hers, All My Puny Sorrows, which was probably one of the funniest and saddest books I've ever read in my life. Ms. Toews was raised a Mennonite and both of these novels have protagonists who were also raised Mennonite. I did a little background reading about the author as one does when one is enchanted and have discovered that both of these books are somewhat autobiographical which goes to say that her life has not been easy and has contained many sorrows, some of which are not puny in the least. Also, she was in a film, although she is not an actress, made by Carlos Reygadas, who found her picture on a book jacket and inundated her with e-mails until she agreed to meet with him. There's an old review of the film by Roger Ebert and it, like her books, won some pretty impressive awards. Anyway, I had no trouble sleeping until eight this morning. I got a text from Jessie inviting me to her midwife appointment and I went. All is well and as it should be and then Jessie and Vergil and August and I went to lunch. Of course. But before we went, August sat on his potty and his dad played trumpet for him. 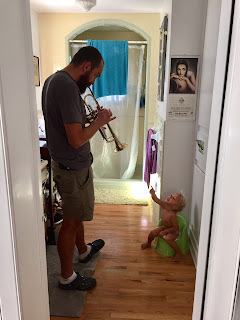 August can also make a sound with the trumpet with his little boy lips and puffed out cheeks and I was quite impressed. The trumpet is so heavy that he asked me to carry it for him. After lunch I got to babysit the boy while Jessie and Vergil went out for a little couple time which was a complete joy. We read books for almost an hour solid which is the easiest way to entertain a child I know. And one of the most pleasurable. For me, at least. He is really starting to talk in sentences, albeit short ones, and of course he has me completely under his thumb and seems happy enough to spend time with me. We did take a reading break for him to eat a banana with peanut butter and he ate the whole banana, one little peanut butter covered bite at a time, his mouth open like a baby bird's, and he laughed every time I popped another piece into it. After I left the Weatherford house I realized that I would be getting to Owen and Gibson's bus stop at just about the right time to pick them up and so I called Lily and she said that would be fine and so I did and then I took them home and chatted with Lily for a few minutes and got to hug Magnolia who was playing outside with her pal, Wiley, whom Lily is taking care of a few days a month while his mama works. I came home and did a few chores around here and it's just been a very nice day. I'm about to make us some lovely simple soup with ingredients like ginger and scallions and tofu and rice ramen and a fresh egg and these. 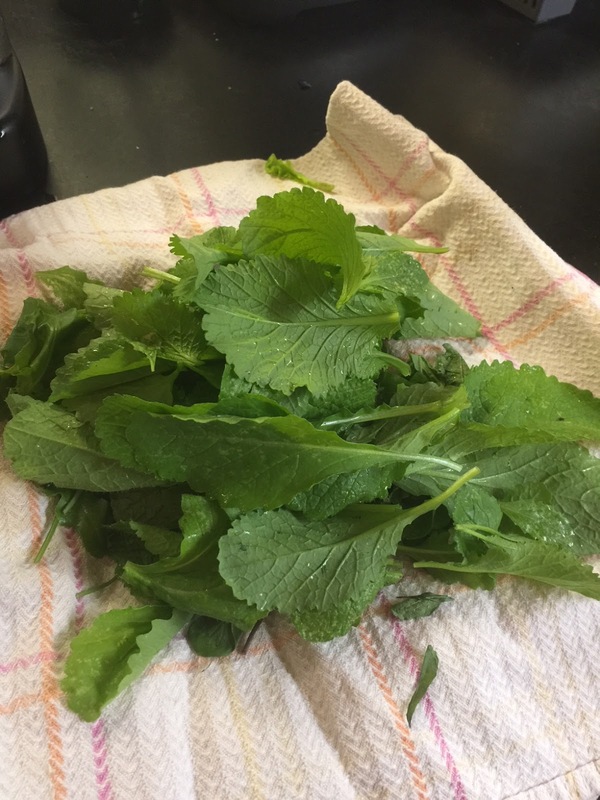 Just picked baby mustard greens from the garden. I keep complaining that I have no real desire to work in the garden with this unreasonable and unseasonable heat but there are things coming along. They need a little attention and a lot of mulching but I'll get around to it soon and in the meantime, the thinnings are becoming part of our suppers and that is a motivational pleasure. It's one of those days where I am just damn happy to be who I am. I hear an owl calling out in the woods by the railroad tracks. Night has fallen in Lloyd. Do I know Miriam Toews? Miriam Toews is my favourite author ever. I love her and every word she has ever written is amazing. I often check online just to see if she has another book out and I preorder them. A Complicated Kindness is my favourite. Actually, I recommend all her books. I knew you would know and love her! I plan to read all of them either with my eyes or ears. Jessie is doing very well. As her midwife said today, "She's so beautiful that it just seems like she could be pregnant forever!" Miriam Toews books are my friends and I pull them out whenever I want to visit with them. They are books I will never get rid of. That potty picture – the herald and the cherub! my paltry attempt at a fall garden has been a failure. bugs ate the sprouting spinach and I never replanted. didn't water the sprouting beets enough and they shriveled up. never got any broccoli or cauliflower plants. just too busy to give time to the gardens right now. besides it being too damn hot. Steve Reed is a genius!!!! And in this second I have to say I will forever remember the trumpet and the potty! What a fantastic day. The picture is divine. The best kind of day. Such a great photo of Virgil serenading August. My husband used to play his guitar next to my son while he did homework in middle school. It helped him sit still over the work, feeling focused, accompanied, loved. Your photo reminded me of those days.